Backing out of 90-degree on-street parking into a busy road is generally recognized as a very dangerous parking maneuver. Drivers often can’t get a good view of oncoming traffic before pulling into it, leading to driver anxiety and accidents. So when The Kleingers Group started a safety improvement study for Blue Ash Road in the City of Deer Park, the existing 90 degree on-street parking was a major concern. The transportation and infrastructure group used Miovision Scout Data Collectors—a camera that records video for use in data collection and observation—to observe parking maneuvers along the corridor. With video capture they were able to cost effectively perform over a day’s worth of observations at a birds eye view. What they found was surprising: a good portion of drivers were already backing into the existing 90-degree parking spaces to enable themselves to be able to see when they pulled out later. This knowledge led The Kleingers Group to consider reverse angle parking, an innovative solution. Unlike traditional angled parking, in which drivers pull into a space head-on, reverse angle parking encourages drivers to drive just past an open space and back in, vastly improving visibility when they pull out. 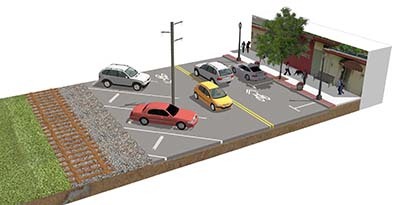 The result is parking that is safer for both drivers, cyclists and pedestrians. Although reverse angle parking is less common than traditional angled parking, the data from video observation showed that a culture of backing into on-street parking already existed. Although education campaigns will still be necessary to acquaint residents with the alternative parking scheme, many drivers won’t have to substantially change their habits. By encouraging the remaining drivers to also back into their parking space, accidents should be reduced and parking will be safer for motorists, cyclists and pedestrians. The result is increased economic development—including visitors, shoppers and diners—as people feel safer parking and, as a result, frequenting the area. Improvements to Blue Ash Road are expected to be completed in 2019.